Clash (and Collaborations) of the Generations: The Multigenerational Workforce with Deb Mohlenhoff and Amie Hendrix. Understand the different age groups and how to best engage all employees in ways that will enhance working relationships across generations. Monday, April 22, 2019 from 9:00 am – 12:00 pm in the Borg Warner Room of the Tompkins County Public Library, S. Cayuga St. at E. Green St., Ithaca. Fee is $70 and includes light refreshments. Transitioning from Peer to Supervisor with Michelle Hallock. This is a workshop for all new supervisors or those who aspire to be promoted to a supervisory position. Tuesday, May 7, 2019 from 9:00 am – 12:00 pm in the Borg Warner Room of the Tompkins County Public Library, S. Cayuga St. at E. Green St., Ithaca. Fee is $70 and includes light refreshments. Boundary Setting for the Helping Professions with John Vasello. This workshop for health and human services professionals will review and discuss the values and ethics that guide professional practice. Tuesday, May 14, 2019 from 9:00 am – 12:00 pm in the Borg Warner Room of the Tompkins County Public Library, S. Cayuga St. at E. Green St., Ithaca. Fee is $70 and includes light refreshments. Getting Projects Done – A Workshop for the Accidental Project Manager with Kelly White. For anyone interested in learning the basics of project management. Tuesday, June 13, 2019 from 9:00 am – 12:00 pm in the Borg Warner Room of the Tompkins County Public Library, S. Cayuga St. at E. Green St., Ithaca. Fee is $70 and includes light refreshments. Walking Our Talk – Putting the Building Bridges Principles into Action with Kirby Edmonds, Laura Branca, Anne Rhodes, and Elan Shapiro. This workshop is for anyone who wants to put the Building Bridges principles into practice in their organizations and communities. Monday, April 8, 2019 from 8:30 am – 12:30 pm in the Borg Warner Room of the Tompkins County Public Library, S. Cayuga St. at E. Green St., Ithaca. Fee is $70 and includes light refreshments. Be a Self-Compassion Super Hero! with Sue Mann. In this workshop, you will learn to motivate yourself with kindness rather than self-criticism. Tuesday, March 26, 2019 from 9:00 am – 12:00 pm in the Borg Warner Room of the Tompkins County Public Library, S. Cayuga St. at E. Green St., Ithaca. Fee is $70 and includes light refreshments. Effective Leadership Through Coaching with Munna Rubaii. In this workshop, you will learn the fundamentals and practical techniques of coaching to strengthen your leadership and help your team achieve their potential. Monday, March 18, 2019 from 9:00 am – 12:00 pm in the Borg Warner Room of the Tompkins County Public Library, S. Cayuga St. at E. Green St., Ithaca. Fee is $70 and includes light refreshments. Sexual Harassment Prevention for Supervisors and Managers with Kristi Taylor. This interactive workshop is intended for supervisor/manager level staff. It will provide valuable and practical knowledge about sexual harassment prevention in the workplace. It will also fulfill the training requirements outlined in the updated NYS Sexual Harassment Regulations that went into effect October, 2018. Tuesday, March 12, 2019 from 9:00 am – 12:00 pm in the Borg Warner Room of the Tompkins County Public Library, S. Cayuga St. at E. Green St., Ithaca. Fee is $50 and includes light refreshments. Sexual Harassment Prevention with Kristi Taylor. This interactive workshop is intended for non-supervisor/manager level staff and volunteers. It will provide participants the opportunity to gain valuable knowledge about sexual harassment prevention. Tuesday, March 5, 2019 from 9:00 am – 11:00 am in the Borg Warner Room of the Tompkins County Public Library, S. Cayuga St. at E. Green St., Ithaca. Fee is $40 and includes light refreshments. Collaborative Grant Writing with Jana Hexter.This course is designed to give you the self-awareness and skills to lead a short-term team to success and collaborate on grant projects where everyone gets on, work gets done, and goals get accomplished. Wednesday, February 27, 2019 from 9:00 am – 12:00 pm in the Borg Warner Room of the Tompkins County Public Library, S. Cayuga St. at E. Green St., Ithaca. Fee is $70 and includes light refreshments. Building a Culture of Trust with Erica Marx. 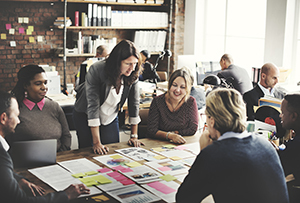 In this fun, fast-paced, and highly interactive workshop you will learn how to create a culture of trust on your team where challenges are met with creative solutions, productivity increases, and work satisfaction soars. Thursday, February 7, 2019 from 9:00 am – 12:00 pm in the Borg Warner Room of the Tompkins County Public Library, S. Cayuga St. at E. Green St., Ithaca. Fee is $70 and includes light refreshments. Cancellation policy: All registration purchases are final – we are unable to refund fees or transfer fees to another workshop for missed sessions. At times a workshop may be cancelled due to inclement weather or other issues. If this occurs, we will post the cancellation on our website, email all registered participants, and refund any prepaid fees. If you plan to walk-in, please check our website for the most up-to-date information prior to attending. Registration & Payment Payment is expected at time of registration. If you are unable to register online you may register by calling 607.273.8686 or emailing registration@hsctc.org. Check payments should be made out to Human Services Coalition and mailed to 171 East Martin Luther King Jr./State St. #133, Ithaca, NY 14850. Those registering at the door may pay by either check, credit card, or exact cash. Agencies may be invoiced. Special Needs Please notify us if you have any special needs; the Coalition wishes to make its workshops accessible to everyone.